Defining moments in television... the Moon Landings, perhaps? Royal Weddings? The first episode of Going Live!? Nah, much better than all those is the day Challenge TV came to Freeview. Alright, maybe I'm not completely serious on that, but it certainly was a great moment for retro-heads like me. The ability to watch old episodes of Wheel of Fortune, Catchphrase along with newer shows like Pointless, or Takeshi's Castle (I'm not such a fan of Who Wants To Be A Millionaire) is marvellous, and the channel is worth the licence fee alone. But the absolute crowning glory for the channel is the re-runs of The Crystal Maze (Well, it is now they're not showing Knightmare anymore). What's that? 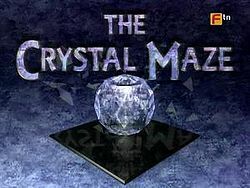 You've never HEARD of the Crystal Maze??? Then you NEED to watch it, try tuning into Challenge (46 on Freeview, some other number on Sky, possibly still 121) at 6pm on a weekday, or around dinnertime at Weekends... you'll most likely catch it then. But for your benefit, I'll try and explain. 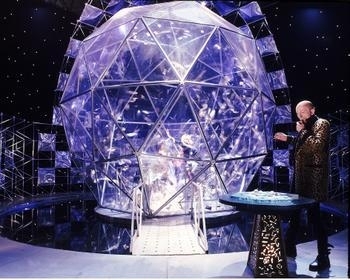 The Crystal Maze was an hour-long gameshow in which a team of six would attempt to "Crack" the Crystal Dome. The Maze itself was divided into four themed zones, originally it was the Futuristic, Aztec, Medieval and Industrial zones, but the Industrial Zone was later replaced by the Ocean Zone. In each of these zones the team would have the chance to play usually 4 or 5 games, each timed from 2-3 minutes. Successful completion of the game would result in the acquisition of a crystal. 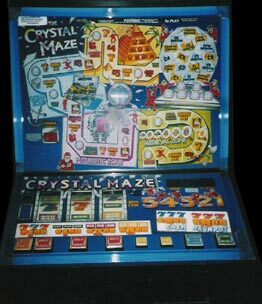 At the end of the 4 zones, each crystal would be worth 5 seconds of time in the Crystal Dome itself, where the team would attempt to collect as many Gold tokens as they could, and, after deducting any Silver tokens from their total, a score over 100 would win the big prize. Or Prizes. Slight problem, the Crystal Dome is essentially a big wind tunnel with the tokens flying everywhere. Sounds like fun to me. So that's the Crystal Maze in a nutshell... but keep digging and you find there's actually more to it than that. First off, the games themselves ranged from very easy to excrutiatingly difficult, and failure to leave the game room within the time limit would result in a team member being locked in with no escape... unless the rest of the team was willing to sacrifice a crystal to buy them out again. Some games featured an automatic lock-in too, usually a 3-strike thing (don't drop something or set an alarm off perhaps) or an instant lock in for something like touching the floor. Games came in four flavours, too; Mystery, Physical, Mental and Skill. The team captain would call the odds, stating what type would be played next, and which team member was going to try it. Some of my personal favourite games were the "Medieval Battering Ram" and the "Futuristic Circuit Puzzle", whilst I was always filled with dread at the thought of the Future Zone's very difficult "Carry the Crystal Safe" Physical game, which was basically a test of steady hands. Not many contestants made it out of that room, and I think I can only remember it being completed once. And as yet, I haven't mentioned all the finer points such as Richard O'Brien's presenting skills and the backstories he came up with for aspects of each zone, his impromptu harmonica performances, his "mumsey" living in the Medieval Zone, and how much poorer it all seemed when Ed Tudor-Pole took over. Of course, the show's popularity was immense, and soon there were board games, interactive Crystal Maze games (I so wish I'd gone in the one in the SandCastle at Blackpool), SWPs and even Fruit Machines. There's a good reason it's being repeated countless times on Challenge... it's nothing short of pure awesome, and if you haven't seen it yet, sort it out and watch it. A great show, no question. During its first run I tuned in devotedly. But years later, reading how the episodes were manufactured and not entirely spontaneous, my love of the program has sadly become somewhat tainted (accounts of the making coming from contestants and producers alike). Still a wonderful show in the early 1990s.